Polybios: Ils sont fous ces Americains! Ils sont fous ces Americains! A free trade agreement is being negotiated between the US and the European Union. France has demanded that European countries should have the right to impose quotas for the amount of American culture, films etc. in TV and other media. This French attitude is being ridiculed in some circles. But seen in the light of extrapolations of the present trends in the World and in the light of historical precedents, the French demand is reasonable. - It points to many of the clear parallels between our present modernity and the Greco-Roman modernity. Like if we repeat many things from that certain part of the past with a time lag of 2 millennia. - The books also show the European skepticism towards the Romans and thus transferred to our time the Americans. As Asterix' friend Obelix often says: Ils sont fous ces Romains! These Romans are crazy! - but the books also show the admiration and uncritical imitation of the Romans by other people in Gallia. And thus the same imitation in Europe today of the Americans. As the German group Rammstein sings "Vor Paris steht Mickey Mouse" ( before Paris stands Mickey Mouse). It points to Disney World standing outside Paris. But the wording also sounds like Mickey Mouse as representative of the whole American culture being an army ready to invade Paris. What is Crazy about the Americans? The idea that America should be Gods own country. The enormous focus on material richness and admiration of the very rich. Of course Europe also has a focus on attaining richness and indeed Europe has invented modern capitalism. But even a European capitalist is outraged when Paris Hilton takes showers in champaign. And again I say to you, It is easier for a camel to go through the eye of a needle, than for a rich man to enter into the kingdom of God. Americans seeing their own country as having special rights in the World. I have already pointed to things like the American use of the Swift computer system to follow money movements between Europe and the outside World, the illegal hunt for terrorists abroad including of suspects in Europe and flights with these suspects over Europe. Few have any doubt that the US governments electronic surveillance of its own citizens internet use also extends to the citizens in Europe. A conceited belief in own values, being they puritan or the superficial World presented in films and other media. The carrying of weapons seen as the right of everybody no matter the consequences and even no matter how lethal they are. The cowboy mentality against other countries. Social welfare seen as evil and unchristian. Obama described as Anti-Christ. How can it be against Christ to aid the poor through things like health care? Have these people never heard of the Good Samaritan? The unforgiving and uncompassionate condemning nature of American puritan Christianity. The use of the brutal and indeed uncompassionate death penalty. ….. first cast out the beam out of your own eye; and then shall you see clearly to cast out the mote out of your brother's eye. This all points to a a reading of the Holy Bible that stops early in the Old Testament and certainly never has reached Isaiah 53. Europeans eagerly follow the Oscar awards staying awake at night to watch it live even though the often far better European films only fall into the category "foreign language films". Super bowl is catching more and more interest in Europe. Halloween has already become a European tradition for our children. Valentine is also a new tradition in countries where it wad never heard of earlier. Even the somewhat ridiculous phenomenon Cheer leaders is spreading here. A very large part of films shown in European cinemas and TV channels are American. This even seems to have been a part of official US policy. Part of the American aid to France after WW 2 was given with the obligation that it was to be spent on buying Hollywood films! Also our children are exposed to this influence. Extremely superficial American talk shows and series with never ending canned laughter is dominating TV for children here as well. Facebook… Used by everybody in this strange small Scandinavian country, where nobody seems to reflect on or question anything. Even left wing politicians and state owned radio and TV stations use Facebook instead of an ordinary homepage. Nobody give it a thought that Facebook is a commercial establishment and that users are at the mercy of the owners and indeed American surveillance. Only 2 percent of teenagers in this country do not have a Facebook account! Sooner or later I suppose the local government will make it mandatory to have an account! This invasion force is about to take the rest of Europe as well. The demands of the Market mechanisms dominate the countries in Europe even more that the United States. I have already mentioned the American Rating Agencies. These market demands are carried out without reflection. Keynes is forgotten. Germany is acting as an agent of the market mechanisms and enforcing their demands over the rest of Europe. Scandinavia used to be proud of its models in social welfare and the well functioning organization of the relation between the work force and employers. Now everything is with joy being broken down and the societies changed into places where everything is regulated only by market laws. All in the name of global competition and the Holy Markets. For a true European the United States does not look like Gods own country. It more looks like the country of Pluto. No not the dog of Mickey Mouse, but Pluto, the god of money and the Underworld! One can fear that even if many Europeans in our generation still may say as Obelix, the next generation is being brought up with American culture in the form of films, the Net and TV. Vor New York steht Obelix. But our children’s minds may already have been invaded by Mickey Mouse. In the Mediterranean World 2000 years ago Greek survived in the East. 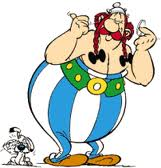 Here Latin did not win like it did in Gallia outside the village of Asterix and Obelix. A deliberate effort like the one advocated by France might be necessary if like Greek the European cultural languages of today shall survive. If nothing is done, then in 100 - 200 years most of Europe will speak American English. Zee, not zed! .... the French language for centuries on Earth represented civilization. Let us hope it will stay that way, also for the other European languages! Ils sont fous ces Americains!! !